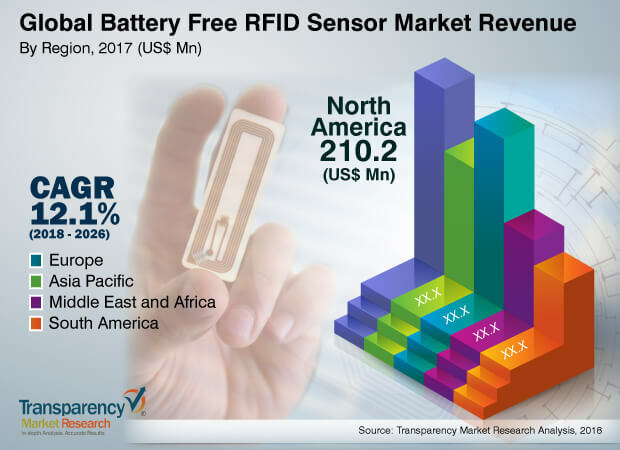 According to a new market report pertaining to the battery free RFID sensor market, published by Transparency Market Research, the battery free RFID sensor market is expected to reach US$ 1,269.2 Mn by 2026, expanding at a CAGR of 12.1% from 2018 to 2026. According to the report, the battery free RFID sensor market will continue to be influenced by a range of macroeconomic and industry-specific factors. Asia Pacific will continue to be at the forefront of global demand, with the market in the region growing at 14.6% through 2026. In Asia Pacific, China, India, Japan, and South Korea are expected to be the major contributors to the growth of the battery free RFID sensor market over the forecast period. Battery free RFID sensors are the unique sensors that transmit the data without the help of batteries. These types of sensors are widely used in different applications where accessibility is restricted or where use of battery is not recommended. Market demand for new sensors for food quality and safety stimulates the development of new sensing technologies that can provide an unobtrusive sensor form, battery-free operation, and minimal sensor cost. Growing demand for food quality monitoring is driving the market for battery free RFID sensors and is expected to create a better opportunity for battery free RFID sensor manufacturers in the coming years. Battery free RFID sensors have become one of the most important subjects for scientists to conduct research on. The global battery free RFID sensor market has been broadly segmented in terms of frequency, application, end-use industry, and geography. Based on frequency, in terms of revenue, high frequency and NFC segment accounted for major market share of more than 50.0% in 2017 and is anticipated to expand at a CAGR of 13.5% during the forecast period. In order to fulfill the global demand, various battery free RFID sensor manufacturers are now focusing on research and development activities on a regular basis in order to find advanced applications of battery free RFID sensor. Connectivity is a major competence required to operate IoT based applications and devices, which includes both consumer and enterprise infrastructure devices. Battery free wireless sensors can fulfill the high-accuracy needs of a wide range of applications, and system installation & practices. These types of sensors are cost effective, easy to operate, and have low maintenance cost. Based on application, the battery free RFD sensor market has been segregated into food quality monitoring, supply chain management, condition monitoring, structural health monitoring, and others. The supply chain management segment held the highest market share in 2017, contributing the maximum revenue. One the other hand, the food quality monitoring segment is expected to expand at the highest CAGR of 13.0% during the forecast period. The supply chain management segment is expected to expand at the second highest CAGR over the forecast period. On the basis of end-use industry, the battery free RFID sensor market has been classified into automotive, aerospace & defense, and commercial. The commercial segment is bifurcated into food, logistics, and others. In terms of revenue, the commercial segment accounted for major market share of more than 60.0% in 2017 and is anticipated to expand at a CAGR of 12.8% during the forecast period. As per TMR analysis, North America accounted for maximum market share of more than 40% in terms of revenue and volume share. The Asia Pacific battery free RFID sensor market is mainly driven by increased investments in modernizing infrastructure and urban population, especially in developing economies such as China, India, and Japan. The battery free RFID sensor market is expected to witness further modifications, innovations, and developments in the near future, since a number of leading manufacturing companies are investing in research and development activity in order to penetrate the market. The research study includes profiles of leading companies operating in the global battery free RFID sensor market. Market players have been profiled in terms of attributes such as company overview, financial overview, business strategies, and recent developments. Some of the key players in the battery free RFID sensors market are ON Semiconductor, Microsemi Corporation, PHASE IV Engineering, Inc., Powercast Corporation, Inductosense Ltd., Axzon, Texas Instruments Incorporated, Infineon Technologies AG, Farsens S.L, and General Electric. Various business strategies are being adopted by market leaders. Companies are focusing on expanding business by developing strategic partnerships and offering innovative solutions in the end-use market.